In 2015, the question for just about every team facing the Trojans wasn't if Tia Furuta would find the back of the net, but when. 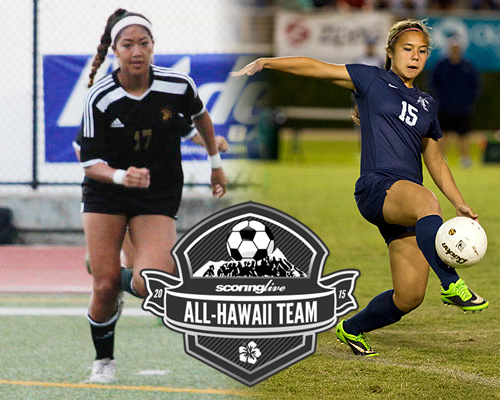 The Mililani junior striker, who scored a state-leading 26 goals this season, was selected by the ScoringLive staff as the All-Hawaii Girls Soccer Offensive Player of the Year. "We knew she was a strong player," said Mililani coach Ray Akiona. "but this year, I think she took her physical strength and took her technical strength and she put it together and provided a great package for us." Furuta averaged a over a goal per game, including a season-high four goals against Waialua. Her ability to score came in clutch for the Trojans during their matchup with Punahou during the state tournament. Down 2-0 at halftime, Mililani opened up the second half with a goal by Furuta in the 47th minute. A goal by Jayna Morikawa tied Punahou and Mililani at two-a-piece, but it was a goal by Furuta 15-yards out that sealed the game for the Trojans in the 77th minute. The win over Punahou propelled the Trojans to the state title game, where they walked away as state champions with a win over Iolani. "She just wants to play as hard as she can," said Akiona. "Once Tia has the ball, she just has a good command of it. Coach Akiona told ScoringLive that Tia has verbally committed to the University of Hawaii at Manoa. Despite her team missing out on the state tournament in 2014, Kamehameha's Hope Tsuneyoshi's performance in league play was nothing short of exceptional, earning her Defensive Player of the Year honors and a spot on the All-Hawaii First Team. "She's brings a lot of power and strength to our team," said Kamehameha coach Melissa Moore. "She also brings that emotional heart to our team." Tsuneyoshi anchored a Warrior defense that held teams to only six goals in the regular season, and although she played on the defensive side of the ball, the senior contributed offensively as well, recording foul goals in the regular season. It was her goal-scoring ability and her strong presence on the field that draw comparisons to former Kamehameha star and current professional soccer player Caprice Dydasco, currently playing for the Washington Spirit. "Both can score goals; Hope scored some pretty good goals for us this year," said Moore. "I would definitely say the comparisons would have to be their heart and desire to compete." Upon graduation, Tsuneyoshi has committed to play for Gonzaga University.